Why am I always making that face when I ride my bike? Here's another race where I'm not very excited to write a report. The weekend as a whole was so tiring, I don't want to re-live it. But I will re-live it. For you. My adoring fans. I went to the Shenandoah Twilight Sprints on Friday night. It wasn't a scored part of the stage race, but it sounded fun and I'd never done anything like that before. It gave me a chance to meet and talk with several of my fellow competitors, which made the whole weekend that much more enjoyable. I only did two sprints (won the first, lost the second, lessons learned about proper gearing for the start) and spent the rest of the time hanging out with the other women. Attending earned me a call-up and a front-row starting place for the road race the next day, though. Our race started cool and muggy with lots of cloud cover, no wind, and a sprinkle of rain in the air. All races were run with combined women's fields. 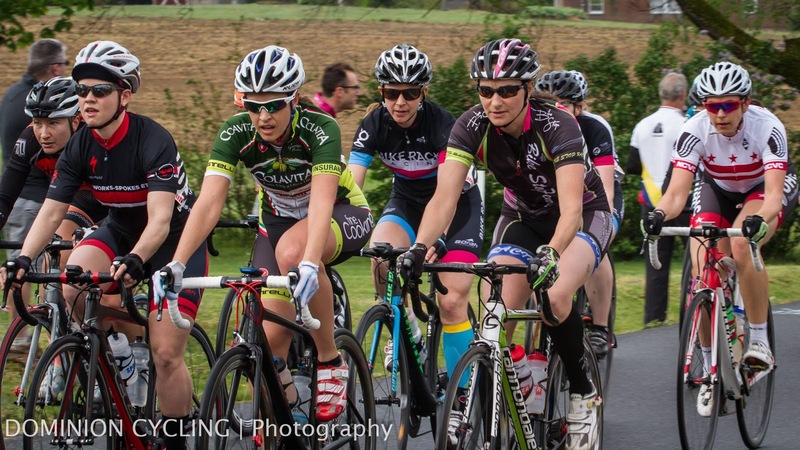 I'm pretty sure we had a full complement of 60 women racing, about half of whom were cat 4. The race was very slow--basically 45 miles of zone 2 riding with a few hard efforts out of corners sprinkled in. I had no problem staying with the pack, although several women dropped off the pace. I think our main pack had 20-30 women, but I can't be sure. Someone told me to hold my line, but not in an unhelpful way. I think the way I learned to ride in a pack is wrong, but no one has pointed it out to me up until this point. I've always worried that I'm one of the "new wheels" in the cat 4 field that we all dread, but now I know that I have been. Something to work on. One of my teammates also told me to work on it. It wasn't mean or nasty either time (and there are women in the field who are mean and nasty about it); it was genuinely helpful. So . . . something to work on. Focusing so hard on holding my line, combined with the brake-y nature of the race, was mentally taxing. I woke up the next day with sore forearms from braking so much. By the time we came to the last 1k, all I felt was relief. I stayed in the pack and didn't try to sprint. I was worried that I would lack the stability to control a hard effort, at that point. Finished 14 out of 32 cat 4 women, not sure in the overall race. I was just happy to have stayed with the pack through the punchy rollers on the backside of the course. After my performance in the road race, I was looking forward to the mental break of grinding out my own race, suffering on my own terms, and taking my own line through all the corners. I got a great warm-up in on the trainer. Rolled to the line and got a strong start. A mile in, I was already within sight of my 30-second gap girl, and was closing time. Then the road started to feel unusually bumpy. Looked down. Flat tire. Pulled over at the next corner marshal. Waited for the moto official to come by. He said he'd make sure that I got a time so that I could start the criterium in the afternoon, and to go ahead and start riding back. I rode for a little ways, but the downhills were too fast on a flat tire, and I didn't want to damage my expensive racing tires (or my rims, for that matter). So I got off my bike and walked the last mile in. It wasn't so bad; lots of the women who were coming back on their TTs asked if I was okay, and everyone was very sympathetic. The officials gave me a time of 37:00, which may have been my actual chip time, come to think of it. That was about 10 minutes off the slowest cat 4 TT of the day, so I was definitely out of contention for the GC. I was just grateful to get to race the criterium in the afternoon. 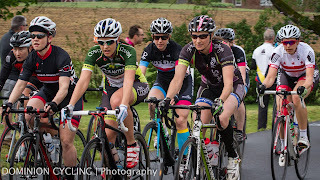 The women's open field had been so overwhelming on Saturday that I was sort of dreading the criterium. It was a technical course with one steep, sustained climb of 30-45 seconds and 8 ninety-degree turns. I really didn't want to have to fight for corners with 30 other women, and I didn't want to have to ride my brakes down every hill and into every corner. I lined up in the second row, but let a few women in front of me. Plan was to hang in the back and see how things looked after a few laps. I missed my pedal on my first attempt to clip in. Once I got clipped in, the girl in front of me was still struggling to find her pedals. And there went my race, right there. By the time I got on top of my pedals, the lead group was two corners away. I figured it was an opportunity to make up for the time trial I missed earlier in the day. Started looking up the road to find someone to work with. Caught several women and a few little groups, but no one going fast enough that I wanted to work with them. Took the first 6-7 laps really easy on the hill (on the advice of one of my teammates) and spun up it in a small gear. I was picking up momentum on the backside and got the hang of the corners quickly. I had teammates on the hill cheering me on and telling me I was making up 5-10 seconds per lap on the main group. On lap 7 or 8, I started hammering the hill instead of soft pedaling. It didn't feel too bad. I felt like I could sustain that effort for another 20 minutes. A lap or two after I started pounding the hill, I saw a group of maybe 8 women ahead of me. I was closing time on them. I was going to catch them. They were coming back to me on the hill. With one more lap, I would be in the shelter of that pack, and could catch my breath while I decided what to do next. The group of 8 crested the hill and passed the finish line. The officials whistled me over and my race was done. The end. The officiating at this race was really poor. Women that I had passed a few laps before were allowed to continue on racing for 2 more laps after I was pulled. The results were all kinds of messed up, with women who had been blown off the back of the pack even farther than I had been placed above me and another teammate who was pulled. The officials' lap counting was really screwed up. I should not have been pulled. I was frustrated. My teammates were frustrated for me. But oh well. That's bike racing. Don't give up, even if you think you're out of the running. And probably some other lessons that aren't occurring to me right now. I'm at this point in cycling, and I have this experience in everything I do, where I have surpassed the quick, easy learning curve. The easy gains have been made, and subsequent gains come only with effort and experience. I'm speaking specifically of skills and tactics, here, not so much in fitness. I can still make big gains in my fitness. But the skills, technique, tactics, and savvy to race really well come only by racing and failing and screwing up and getting back in the next weekend to race again. Playing musical instruments, teaching yoga, kinesiology, visual art, and rugby all came really naturally to me at first. And then, pretty suddenly, they didn't. Because there's only so much you can learn by reading books and watching videos and listening to friends share their experiences. At some point, the only way you get really good at something (even if you're naturally talented at it) is with time and experience and hours of practice. The best part about the weekend was spending it with my team. We rented a house together and stayed there for the whole weekend. Two teammates came and served as our soigneurs, cooking for us and cleaning up after us. It was very pro. I'm still new to Veloworks-Spokes, Etc. This weekend gave me a chance to get to know everyone a little better, especially after all the racing was done and we could relax. My teammate, Kim, got top ten results in the road race and the time trial; another teammate, Robin, got a top ten in the crit; a third teammate, Kaitlyn, took fifth in the GC for the 1/2/3 women; and Clay, our brilliant chef for the weekend, took fourth in the open time trial. So a good time was had by all, and many a lesson learned. Also, Kim and I hit a black bear on the way home. In a car, not on a bike. Bear and car were both fine. "Hit the bear" may be our new team slogan, though.